October is easily the busiest month for me, craft-wise. This is because there's Max's birthday on the 21st, followed shortly after by Halloween. I like to make things for his birthday party, and of course there's a Halloween costume that needs to be sewn. (One of the main reasons I love being able to sew is because it means I can sew a Halloween costume for my child.) Invites have not yet gone out for the birthday party, but I'm already starting on the goody bags. This year the theme is "junior naturalist", so I'm making across-the-body style messenger bags for forest expeditions. Here's my prototype, sans shoulder strap. 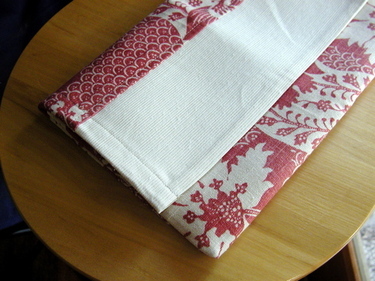 I have large snaps that I'm going to use to close the flap, a not-too-thick belt webbing for the straps. I really like this, I may have to make an extra for myself! I also like that the materials so far cost me only 55 cents. The red fabric is a discontinued decorator swatch, 2 for $1.00. And the white corded fabric was a large remnant piece, on sale for 90% off. I have lots more of both, so I should be able to make the whole bunch from my stash. The snaps and webbing will up the cost a little bit, but I think I'm still doing ok. Inside each bag I want to include a "field journal", sketch pencils, and a watercolor set. 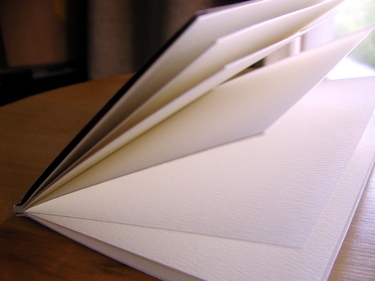 So I need watercolor paper, but bound books of this are very expensive. So I tried handbinding, which I've always wanted to try. I think it came out pretty good, but I want to change how I did the cover. 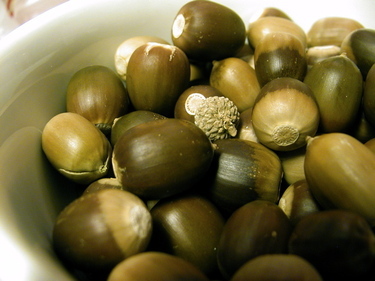 Anyone have any crafty ideas for ways to use about 100 acorns? I can always throw them back outside, or into the compost, but it seems I should be able to do *something* with them! Max and his friend collected these today, they worked really hard at it! I hope everyone had as much fun as we did in the Teeny Tiny Swap! A huge thanks to everyone who swapped in the TTS!!! Max and I had lots of fun making up our packages and we received wonderfully fun packages from others (pictures to be taken this afternoon). I've been checking out the flickr group, and I'm loving all the fun swap packages there! So, to wrap up this swap: if anyone has NOT received three swap packages for their child (or children, however you signed up), please let me know. ALSO if you haven't already done so, please email the mom who sent packages to you, letting them know you received it. (A follow-up thank you card is nice too, but takes longer, so please start with an email.) Email me if you need addresses for this. And if you're interested, I'm cooking up plans for TTS#2! Not very good, am I, to organize a swap and then disappear. I'm sorry about that. I've been reading your emails (and hopefully responding, if I haven't I apologize, I meant to) and having a wonderful time looking at swap photos at our flickr group and on individual blogs. I have a list as long as my arm of things I need to take pictures of, including the swaps Max has already received (thanks Angela and Sally!!). Plus our new "pet", a giant caterpillar that Max and dad found outside today. I'll be abnormally busy at work until mid next week (how did quarter time expand so much? 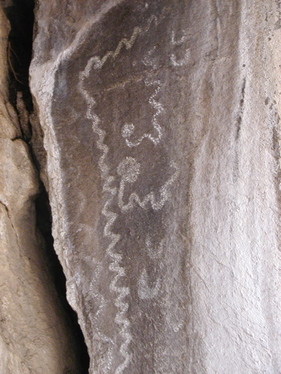 ), so until then here's a picture of pictographs at a nearby hiking spot. This was just above a little spring and was one of many in the area. Signposts saying "water here". Don't forget! The deadline for sending out swap packages is tomorrow, Tuesday!!! I've already gotten some notices that swap packages have gone out--hooray! We're going to be sending ours out tomorrow, we're assembling things today. I've set up a flickr group for us, if you'd like to post photos of the packages you've sent or received. The group name is TeenyTinySwap. If you can't make it by tomorrow, please email your swap partners and let them know there will be a delay. If so, you should try to have your swaps out sometime this week. If you can't make it within one week, please let me know asap. Please don't leave kids waiting!